The sweetest time of the year has arrived! This February, be enchanted by the newest signature desserts at Kiss the Tiramisu available for a limited time. Indulge in the sweetness of Kiss the Tiramisu’s signature vanilla soft-serve ice cream layered with fresh strawberries and caramel popcorn, topped with a generous helping of blueberry drizzle, candy sprinkles, and a special heart-shaped Valentine candy. The Magical Kiss ice cream will leave your heart and taste buds longing for more. Nothing says ‘I love you’ better than Kiss the Tiramisu’s luscious Chocolate Tiramisu Balls. Fall in love with a lip-smacking selection of dark and milk chocolate tiramisu balls covered in cocoa powder, green tea, coconut, and crushed cookies and cream. On February 14, Kiss the Tiramisu has a prepared a special treat that everyone will surely love. All single-receipt purchases of any two Kiss the Tiramisu soft-serve ice creams will be entitled to a 20% discount, perfect for couples or those who just can’t get enough of Kiss the Tiramisu’s delectable treats. Treating yourself on Valentine’s Day? Don’t worry, as all Kiss the Tiramisu ice cream purchases will come with a free Valentine chocolate chip cookie. This is available for any purchase of Kiss the Tiramisu premium soft-serve ice creams: Classic Tiramisu, Matcha Tiramisu, Injeolmi Tiramisu, Midas Touch, and Magical Kiss. With its intimate setup and cozy interiors, Kiss the Tiramisu is the perfect place to create the sweetest of memories. Drop by the Kiss the Tiramisu flagship store at Three Central, Valero Street, Salcedo Village, Makati City for a taste of heavenly desserts. The Magical Kiss premium soft-serve ice cream is available at Php295.00 for the whole month of February. 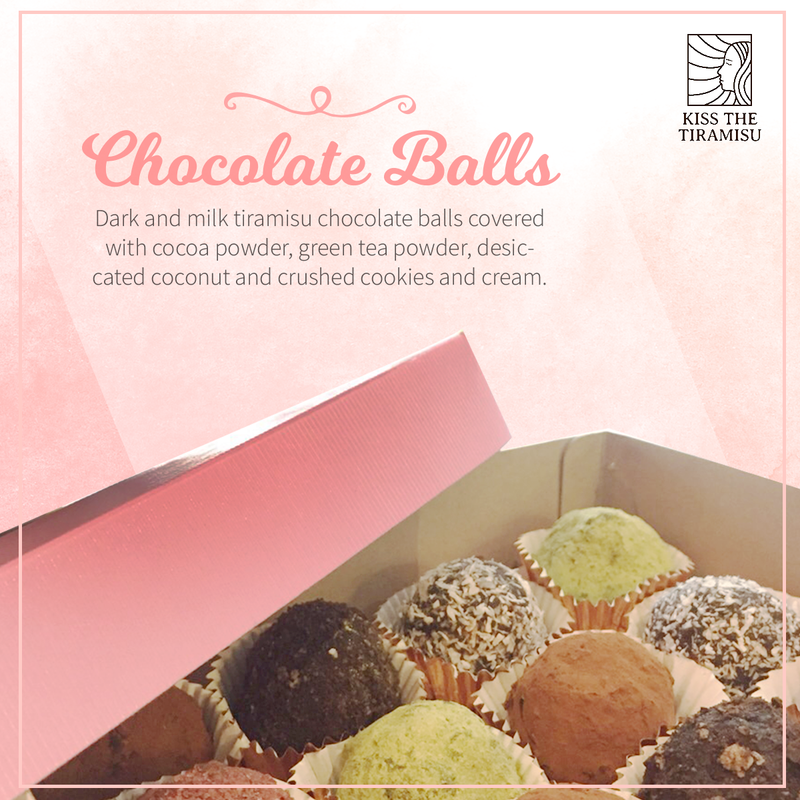 The Chocolate Tiramisu Balls are Php350.00 for 12 pcs., available until supplies last.